EA is offering Battlefield players a great deal on the new Battlefield 5. 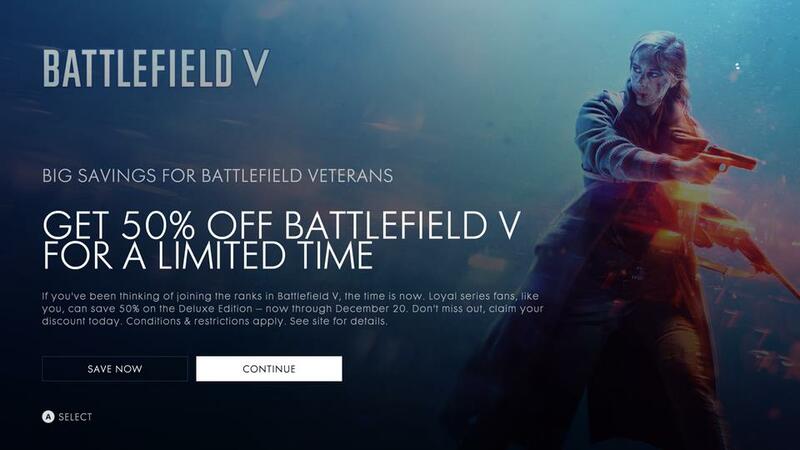 Battlefield series veterans who played Battlefield 4, or Battlefield 1, are reporting getting a big 50% off discount on Battlefield 5. This brings the price down to just $30. Players who jumped in Battlefield 1 this week were surprised to find a landing page telling them about the promotion. The offer is valid until December 20, according to the message. Though it does mention the deluxe edition specifically, players found that the offer also applies to the standard edition (via ResetEra). There are reports of the same offer appearing on PS4, but we couldn’t see it when we tried it ourselves. There’s also no word yet about PC, so we’ve asked EA for a clarification. Usually, EA offers appear first on Xbox One before making their way onto other platforms, like we’ve seen before many times whenever Battlefield 1 and 4 expansions would go free. If you’re looking to get Battlefield 5 as part of this deal, make sure you have Battlefield 1 or Battlefield 4 installed, and launch either to get the offer. If you’re not on Xbox One, hang tight until we verify if other platforms will follow suit.